Edward Winkleman’s “What Has Art Become to Us?” blog post today addressed two current trends in the way the public interacts with art. The first is a tendency to see art as an investment commodity more stable than gold, and the second is the tendency for people to take digital photos of the art they’re looking at. I’m more interested in the latter trend and in a particular distinction Winkleman makes between art viewing venues. He suggests that people are more likely to photograph art in museums than in galleries. He also considers this to be a kind of art viewing “via a digital filter.” He also suggests that museum environments sometimes have qualities similar to amusement venues, qualities that might contribute to this as a preferred way of art viewing for museum visitors. 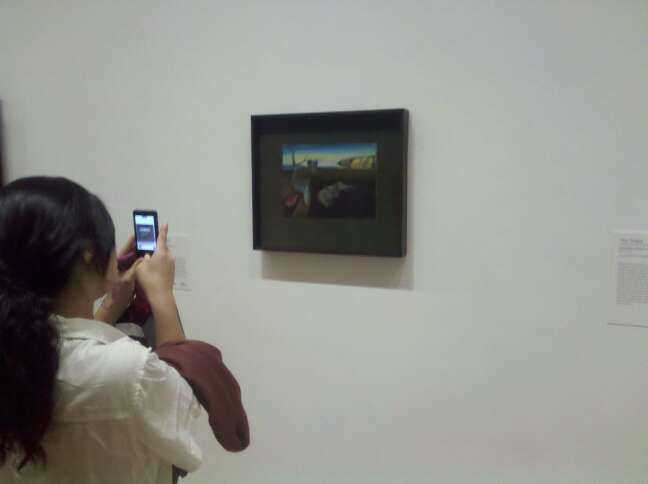 I snapped this photo of a visitor snapping a photo at MoMA for the purpose of showing people that the painting is actually much smaller than the reproduction they saw in all of their friends' college dorm rooms. While I’m ambivalent (agree in some cases, not in others) about Winkleman’s observations about museum environments, I’m not convinced that one kind of viewing supplants another. I may take pictures for reference and/or sharing, (which I’ve certainly done at galleries and countless museums) but would never consider that experience as a replacement for longer, considered looking without a digital device involved. I do agree that this looking at a tiny digital version of what is in front of you can in fact be a way of viewing art. Sometimes, the digital filter, or more so, framing an image of a work of art (especially a three-dimensional work), may actually add to one’s understanding of the artwork. This could, of course, only happen if there is a significant amount of time spent actually looking directly at the work of art as well. …a photograph of a person photographing an artist’s photograph of herself playing a role is a few layers of an onion, maybe the kind to be found only among picture-takers at an exhibition. Art fairs may be the most photographed art venues of all. Perhaps fair-goers wander through them as digital collectors, capturing art that they aren’t likely able to purchase. Winkleman likely has more considered insights into why that may be the case. I am interested in thinking more about why more people take pictures at museums than at galleries. It seems like it should be the other way around if photos were to be usually used primarily as a sort of note taking which is my oft-used defense. Since large art museums are likely to have an online image of what a visitor deems to be a photo-op worthy artwork, why bother snapping your own crummy camera phone version? If people actually do take photos more often in museums (which I agree seems to be the case) this suggests to me that people most frequently snap shots of paintings as a sort of “capturing” of their experience. What’s dismaying is if what’s being captured is an empty experience that didn’t include an actual considered sensory intake of the artwork itself. I tend to post photos of works which interest me with the intent to share them with people who may never make it to see them, but even more so as though I’m sharing a tantalizing blurb from a novel I hope you’ll read yourself. I earnestly hope that sharing a quick snap of a work of art might inspire one to go see a museum exhibit or a gallery show. That’s why I’m taking pictures of pictures. Why are you doing it? This entry was posted in Uncategorized and tagged Art viewing. Bookmark the permalink. Wow, so much I disagree with and question here; thanks for opening up the conversation! First, Roberta Smith’s “the omnipresence of cameras at the Venice Biennale can be read as a dismaying sign of superficial experiences” – is a thoroughly patronizing dismissal of what (as Smith “more generously” concedes), is more fairly and commonly the museum or gallery goer’s best and often only way to “participate” in a dialogue with the exhibition – since museums and galleries are not typically very good at encouraging participation from visitors. Taking a photo of something that interests me in a gallery is not just a form of note-taking, but a way of ‘voting to learn’, of expressing my interest in an active form. Although the museum or gallery will likely never hear my voice in this way (unless they’re checking Flickr for visitors’ images), and even if I never share my images and experience with others, my photographic gesture has a profound impact on not just my memory of the exhibit and visit, but also my affective relationship with the venue itself. This is why permitting photography in the galleries is so critically important to the development of both existing and new audiences – and potentially is such a rich source of viral marketing when visitors DO choose to share their photos with their friends and networks. Second, Winckleman’s view of the camera as a “digital filter” again patronizes the visitor, as though those using cameras neither understand what they are doing nor are capable of resisting a Borg-like co-opting of their vision by the machine. The visitor is in control – a point that so many museums and galleries seem to ignore or not wish to admit. When I take a photograph, the camera enables and encourages me to look more closely, and think more deeply, about what I see through the lens. In addition to being an important tool in the development of visitors’ connections with the museum or gallery, the camera is a critical tool for learning and the development of close looking skills. Nancy, I’m really humbled by how much thought and passion is always behind your comments. I’m also fascinated be the concept of “voting to learn.” I don’t think it’s what you mean, but I imagine a sort of amassing of publicly taken photos of any given art object and the mere existence of the photos meaning that there will be learning about the things people have chosen to photograph. Even if it wasn’t the idea you had, you always inspire some interesting thoughts. Thanks so much for commenting and I’ll try to more thoughtfully respond when I have more than a moment. This piece seems split into two separate and not necessarily related issues of investment versus engagement, with one (engagement) being separated into a populist mode that may or may not inform the second (investment). It seems as if the engagement issue is being taken as a way to attempt a sort of tracking of populism that doesn’t necessarily follow investment, at least as conceived broadly. As I read it, Winkleman’s piece remains speculative on these points without attempting except superficially to draw them together. Important debate! – Thanks to Roberta, Ed W., Nancy and MuseumNerd for the dialogue and posts! I remember how much I wanted to experience our honeymoon 14 years ago that I didn’t bring a camera during our three weeks throughout Spain. Now I wish I had a least a few photos to help my us remember.